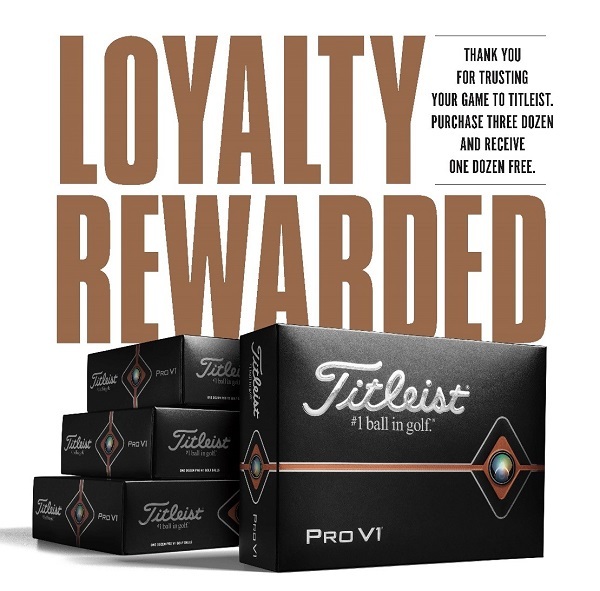 To say "Thank You" for trusting your game to Titleist, purchase three dozen Pro V1, Pro V1x or AVX and receive ONE DOZEN FREE. This exclusive offer is available through Monday, April 22, 2019. Order yours today! Pro V1 or Pro V1x white with free personalization and Standard Play Numbers (1-4 or 5-8). Pro V1 or Pro V1x yellow, AVX white or yellow with free personalization and Standard Play Numbers (1-4). Pro V1 or Pro V1x white with free personalization and all the same Play Number (00, 1-99). Pro V1 or Pro V1x Yellow, AVX white or yellow with all the same play number (1,2,3 or 4). All four dozen must be personalized with the same imprint and ink color. Limit 1 offer per personalization.